Let’s accept it- our smartphone’s screen is a mess. 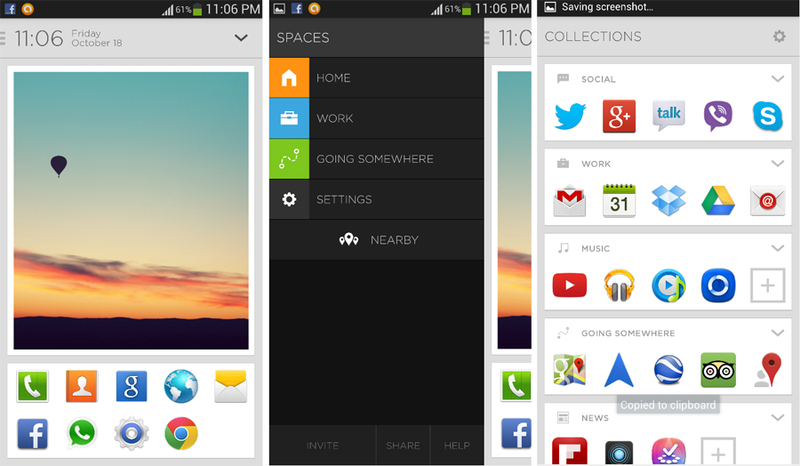 It’s fun because of all the colorful apps icons and widgets, but we have to customize the home screen by ourselves. To put it into words: we have to adapt it to our home screen and do whatever it takes to arrange and design it. ThumpsUp Lab recently released Aviate. It is an application with the ability to intelligently simplify your smartphone and to do so without your help. This application is not a first of its kind but the others do not stand as tall as Aviate’s neat design and very competent performance. It is still on beta phase, so it has its fair share of oddities. The idea behind Aviate is simple: the phone adapts to you. Time and location are the key factors that make this app a cut above the rest. It is like putting your phone in autopilot. 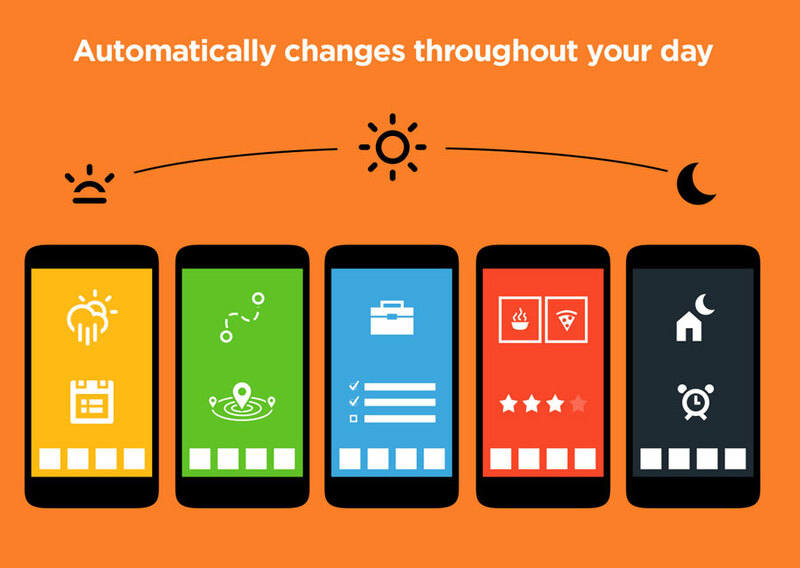 Aviate changes the home screen, depending on where you are and what time of the day. When you leave for work, it will show all your navigations, as well as check traffic. At work, it will switch applications and will let you see all the programs you need for work, an add event button for Google calendar, and an email button. But, this software is not all for work. When you go to a restaurant, Aviate can give you appropriate programs, like a blank Tweet with the Twitter handle of the restaurant (if there is any). It will also give foursquare user tips with just a simple touch. On that same page, there are buttons designated to open the camera and check-in. You will never have to scroll through pages to find the application you need. Aviate will give it to you when you need it. It is now currently on beta phase but the upgrade from alpha isn’t a drastic change. But the upgrade fixes serious bugs and glitches, so this is still a welcoming change. The application is designed to keep users absorbed on tasks rather than searching through a number of applications. The software also acts as an effective organizer for all your files in your library, by arranging it into categories that are easy to browse. One concern raised by those who have already tried this product is its relevance and a narrow scope of audience. Currently, work and travel categories are working well; however, it still suggests quite a few inappropriate features. Another thing is that, this software is not meant for power users. If you are the type of person that likes to customize pages in your phone and prefer a handful of applications and widgets, Aviate is not for you. ThumbsUp says that this application is still a ‘work in progress’ project. The recommendations will get better. The software’s interface is best for first-timers who are bothered by other Android interfaces. For people who use smartphones for the first time, this application can be a hit, since it is easy to understand and the design is clean. Aviate’s alpha phase started in July and had around 70,000 users. All thanks to Reddit community who gave positive app reviews. The current beta phase allows every member to have five invites that can be sent to friends and loved ones. ‘Aviate’ works on Android 2.3 and above. Can you please send me a invite code?? Nice review. I like where these guys are going. Innovating on top of the app layer seems a brilliant idea. If you have an invite I’d love to give it a go.